There are plenty of golf GPS watches, shot trackers and swing analyzers out there for even the most obsessed golf fanatic to get stuck into, but until now, getting data has required adding something to your arm, glove or club. Enter Cobra Connect. This shot tracking technology has been added into three of the company's latest drivers, and is designed to go about its business without any input while you play. It's actually a partnership with Arccos, a company that makes sensors that attach to the top of golf clubs for shot tracking. We've used the system, and are big fans - more so than Game Golf, which requires you to physically tap a wearable belt clip before every shot. But are Cobra's connected clubs worth investing in? We spent a few rounds with the Cobra Connect King F7, which retails at $349 them to find out. The principle is simple. A sensor in the handle is paired with the Arccos smartphone app before you play. When you swing your driver (be it a practice or actual shot), the sensor detects a golf shot being played and its GPS position is logged. The app then 'listens' for you next shot via your smartphone's microphone and logs the position of that. You then have the distance, position and quality of every drive, and can start playing with the data. So how does it work? Well, we have to say it's pretty seamless. We had zero issues pairing our club to the Arccos app, and once paired, the connection never dropped. You head to the Pair new club option in the app, select that you want to pair a driver, and you're away. The next thing to do is start a round in Arccos. It's got the details of 40,000 courses built in, and you download the full mapping for each one. Once the round has started you can put your phone back in your pocket and forget about it. There are some in-game scoring, range-finding and mapping features that you can take advantage of if you don't have a golf watch, but we preferred to keep things simple. You'd think that leaving a single club and your phone's microphone to track your shots on the course would be a recipe for disaster, but actually it's pretty seamless. We tested with just the club and the wider Arccos sensor range, and came home with reasonable data to work with. There were some shots not picked up by the microphone, so it's not fool-proof. But if you're using the driver without connecting any of the rest of your clubs then it's actually not essential that 100% of drives are tracked. What you're looking to do is build up a profile of shots over multiple rounds, and start to infer useful data. We'd suggest forgetting about the data for at least three rounds of golf, after which you should have something meaningful to work with. So what's tracked from your connected driver? Well, for a driver the key data is your average distance and the percentage of fairways hit (including which side you missed them on). You can then start to work on these areas of your game, and if you have a coach, is great information to relay when working on elements of your technique. As you can see, 66% of our drives ended up to the left of the fairway, so there's something concrete to work on there. If you're using other Arccos connected clubs then average distances come even more into play, and should help you to select irons based on data, rather than guesswork. That's less important for users of the Cobra drivers, where distance and direction are more pressing issues. However, as you improve, you can see your driving distances creep up. But we'd like to see more from the app. While it's fairly good at discounting shots that are obviously wrong (thanks to shots that aren't recognised, for whatever reason) it would be nice to prune these manually. What's more, it would be nice if data was tracked over time. A graph showing distance and accuracy averages would be really neat, so you can quantify improvement over time. There are plenty of extra ways data could be sliced and diced, and it's a little surprising that those haven't been taken advantage of. Cobra Connect: Is it worth it? While we're fans about what the Arccos system can offer your game, and the non-intrusive way it captures data, we wouldn't rush out to buy a Cobra Connect driver just for the tech. By all means try the driver at the range, and if you're enamoured with it, make a purchase. We're not here to comment on the quality of the club, just the tech embedded within. But for our money the data generated from this single club probably isn't worth financial outlay (you're looking at a $50 premium over a non-connected driver), or the mental investment of tracking each round with the Arccos app. The full Arccos system, which connects every club in the bag? Well, that's a much more interesting proposition – and stay tuned for a full review in the coming weeks. 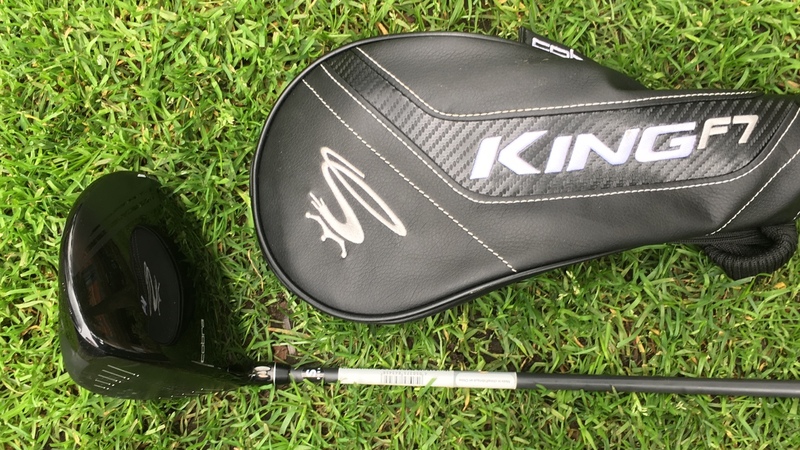 We tested the Cobra King F7 supplied to us by American Golf.